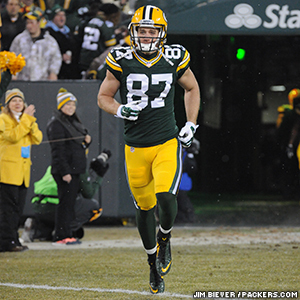 Packers WR Jordy Nelson is the team’s nominee for the first NFL sportsmanship award. Each team has nominated one player for the award, which will annually recognize NFL players who exemplify outstanding sportsmanship on the field. Current NFL players will vote on the award from a list of eight finalists (four AFC, four NFC) compiled by a panel of former players, including Warrick Dunn, Curtis Martin, Karl Mecklenburg and Leonard Wheeler. When the current players cast their Pro Bowl votes on Dec. 19, they will vote for one of the eight sportsmanship award finalists as well. The winner will be announced during the nationally televised “NFL Honors” show, now in its fourth year, the night before Super Bowl XLIX.